Sure there have been other cameras that democratized the space in the past like the amazing edgertronic SC2X we tested which is a 15,990 USD piece of gear and is capable of 2000fps+ at full HD resolution on an APS-C sized sensor. Still very cheap compared to other cameras but not exactly affordable for the common shooter. Now the Chronos 2.1 HD is here to change all that and offer in a fully contained package with a ready to shoot kit for a starting price a third of that. 8GB, 16GB and 32GB high-speed RAM buffer options for 2.5, 5.5 and 11 second record time respectively. Field-swappable internal battery EN-EL4a lasts for 1 hour of recording. Runs indefinitely on AC adapter or external power source. Many lenses supported: Nikon F, Canon EF, Micro Four Thirds and C mounts available as field-swappable options. Focus peaking highlights sharp edges for quick and perfect focus. Zebra lines help you set correct exposure. Sample Resolution and frame rate chart! There will also be 40 early bird cameras ready to ship for the 2019 summer for the lucky few that get there first. Pricing will be the same but you will get the camera earlier. Pre Order Page Here! Watch in 4k for best results, Youtube 1080p compression obliterates a lot of fine detail! The Krontech team will be attending NAB 2019 in Las Vegas to show their cameras and answer questions at their own booth. More NAB Information at the official site here! What’s the catch, this price can’t be real? There is no catch, the camera is a direct evolution of the Chronos 1.4c and a clear winner at least on paper for our #1 spot in our affordable slow motion HSC camera guide. Since the Chronos started at $3k USD the Krontech team has made it possible by using their honed skills to deliver a product which is really a cut above at just $2k more. For $5,000 USD you really cannot even imagine getting a camera close to this level of performance. The camera sports a Micro 4/3s sensor which is considerably smaller than most professional cinema slow motion cameras which start at APS-C size and also the edgertronics but it seems to be a sensor that is not only capable but very sensitive to light which should, in theory, allow for beautiful imagery in 1kfps 1080p and at lower resolutions. We are fans of Micro 4/3rds sensors like the one in the Panasonic GH5 and GH5s which delivers outstanding value for money. These cameras are very capable in the video world and the sheer adaptability of the mount means that it can be used with almost any lens out there sans that of shorter flange mounts like the Sony Alpha for example. The sensor in this Chronos 2.1 – HD is also adaptable to using speed boosters like the excellent Metabones line of m4/3 adapters which allow for a full stop improvement in light gathering as well as allow for APS-C field of view on the smaller area 4/3 sensor. We can already get excited about the light gathering improvement in a camera like this with the appropriate adapter. Remember, you can never have enough light when shooting slow motion video. The Sensor is a LUX2100 from Luxima with 1952 x 1096 pixels & 1080p resolution with a max full readout of 1004fps at 1080p. The camera body will be identical in shape and dimensions to the Chronos 1.4c and there will be an adapter to incorporate Micro 4/3 lenses as an add on. You should be able to use any C mount to EOS or C mount to Nikon adapters for using those lenses. The HDMI port will also export a 1080p image at 100ms delay time which is the same as the back screen. This is short enough to allow the use of larger accessory screens and or viewfinders with the camera. SSD Drive saving will be 60MB/sec or 13 – 1080p frames a second in RAW DNG format. Much faster H.264 saving than DNG like in the original Chronos. Yes, the Chronos 2.1 – HD will have a new screen capable of 1000 nits which according to the spec sheet will allow full sun visibility outdoors. This was a big issue with the original Chronos 1.4c which requires not only a sun shade but even some guessing as to focus and framing in sunlight. If this screen is that good then this is simply the best upgrade to the camera after resolution! Now you can take your Chronos out and shoot without a separate monitor in daylight while composing and operating the camera. Very exciting news! 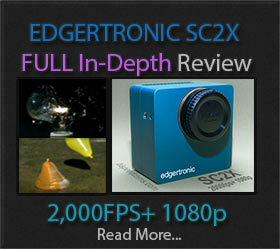 Maximum Frame rates, this is a serious piece of gear! As you can see in the table above, you can really push this camera to limits never before attempted in this price range. The camera shoots in 32×2 pixel increments which means you can literally punch in any multiple of those like 64*4, 128*8 and so on until full HD on the sensor to get a plethora of combinations. At 100,000fps 1920*8px the maximum this camera can offer you will be able to see a bullet fired and smashed if framed right with excellent temporal detail. Of course, you will want to use resolution accordingly depending on the subject matter and the display where it will be ultimately shown. You will still get the 720p 1500fps popularized in the Chronos 1.4c with a sensor center crop if needed which means you don’t really lose this ability if you upgrade to this camera. We are very happy to see this spec retained and now with 34% Larger Pixels. The camera should start to ship this summer to early bird buyers and shortly thereafter to regular orders. The hardware is finalized and working so they need to build the cameras after the orders come in. Krontech delivered hundreds of Chronos 1.4c cameras after their Kickstarter campaign and has continued to fulfill new orders day in and day out, we have full confidence in their ability to deliver on these cameras after purchase. We hope to get one of these cameras soon for testing and evaluate how well it performs. 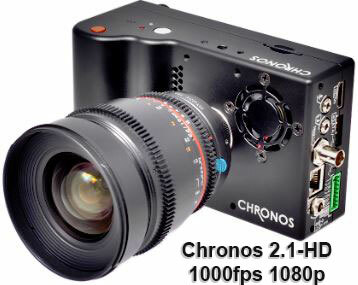 Looking forward in the Chronos 2.1 HD to a much larger sensor experience in 4/3rds than the Chronos 1.4c 2/3ds sensor. The pixel size alone should deliver a much better image with less noise and artifacts out of the box at 10µm vs 6.6µm in the Chronos 1.4c or 34% larger. New sensor technology should also play a significant role in delivering on the image quality front. The Chronos API should be released soon which will let users build applications and control the camera or array of cameras in unlimited ways. Once this API is released the original Chronos 1.4c camera will increase in price by $401 USD to reflect added capabilities and keep up with inflation while at the same time supporting the development of the software. We thought it was an April’s fools joke when Krontech.ca released a teaser image on April 1st showing a 48 Chronos 1.4c camera rig to record in 360 degrees in super slow motion. However, the Rig is not only real but a world first in recording this type of content at 68 gigapixels/sec in glorious super slow motion. Krontech was kind enough to share early samples of the technology in the video below. Rest assured this is in alpha stage so any miss-alignment or slight jumpiness should be fixed by release time or by the customer on location. The technology of the Chronos Ring should, in theory, allow for a completely new 360º degree perspective in recording super slow motion footage for TV shows, commercials, and scientific applications. We are eager to see more of what this rig is capable in professional hands. Expect to see blockbuster movies and or TV using this technology to create the next generation VFX shots to move forward the art of practical effects. What an awe-inspiring technology. V0.3.1 is now out of Beta, fully tested and released. Follow this link to get the new software. Follow the instructions and back up your calibration before updating! To Pre Order a Chronos 2.1 – HD follow this link & if possible, please mention HSC at check out to help us measure the reach of our site! 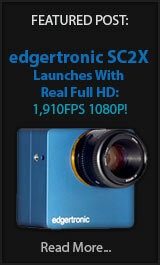 Previous PostChronos 68 Posted by Krontech, April’s Fools or legit?Next PostTerra 4k Firmware Update Allows 320fps 2k! Hello, i looking for high speed camera without BNC, ethernet connector only high speed camera for low cost, there is one? Look at the camera guide list on this website for other options.